HF: W C Gomersall was born in London, UK in 1895 and died in Hong Kong in 1960. In 1928 he founded China Engineers Ltd in Shanghai. 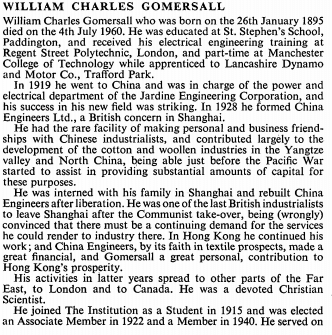 Post WW2 Gomersall and the company moved to Hong Kong. This obituary is extracted from the journal of the Institution of Electrical Engineers a British professional organisation. This article was first posted on 23rd July 2014.